Every once in a while, I look at the App Store and notice another mediocre word game near the top of the charts. I’ve given these games a chance, in case I was missing out on something. 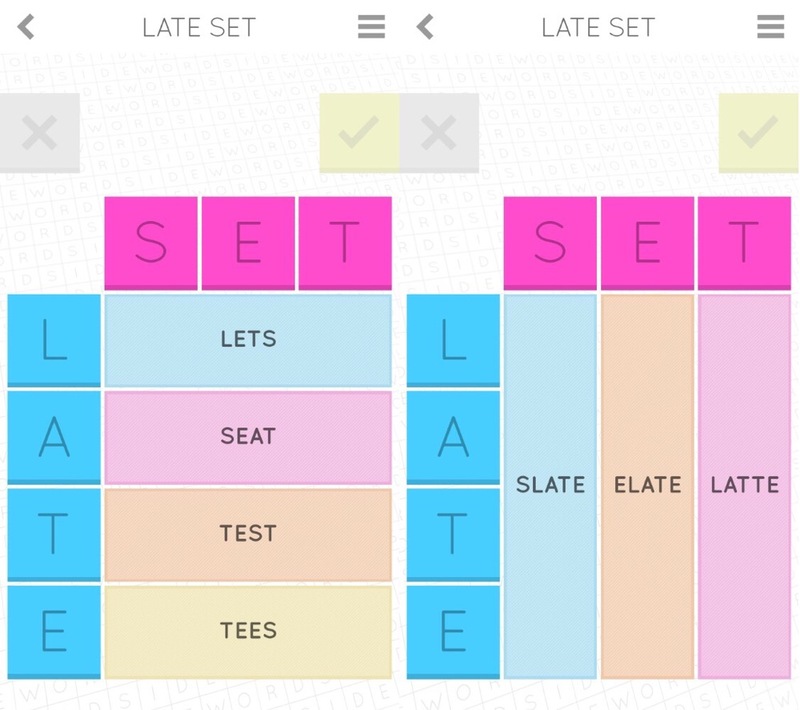 I like a good word game, as I still play Zach Gage’s Typeshift daily. But these free games that get tons of downloads are all overly simplified and probably auto-generated, since there are hundreds — even thousands — of levels. What they usually involve is taking the four or five letters on the screen and guessing which words the computer wants you to make from them. Sometimes you get extra points for thinking of a word it didn’t ask for, but other times it just doesn’t recognize valid words at all. Anyone with a firm grasp of the English language should be able to get pretty far in these games without much trouble. Granted, I haven’t stuck with any of them long enough to see if they get more interesting, as I find them painfully boring. But what these games also do is stick video ads between every level. So the easier the puzzles are, the faster you’re going to get to the next ad. Anyway, where is this all going? My point is that it’s refreshing when a trickier and more unique game comes along, especially one that isn’t just throwing filler at players to get ad revenue. 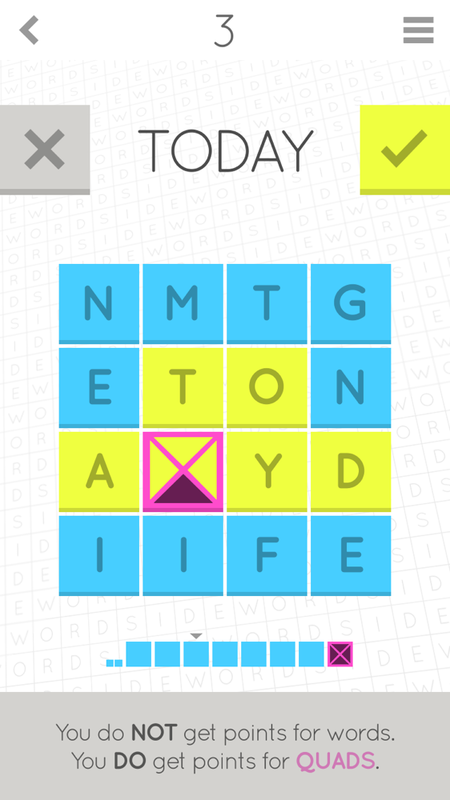 Typeshift is one of these games, and I’m happy to announce that Milkbag Games’ Sidewords now joins the list. 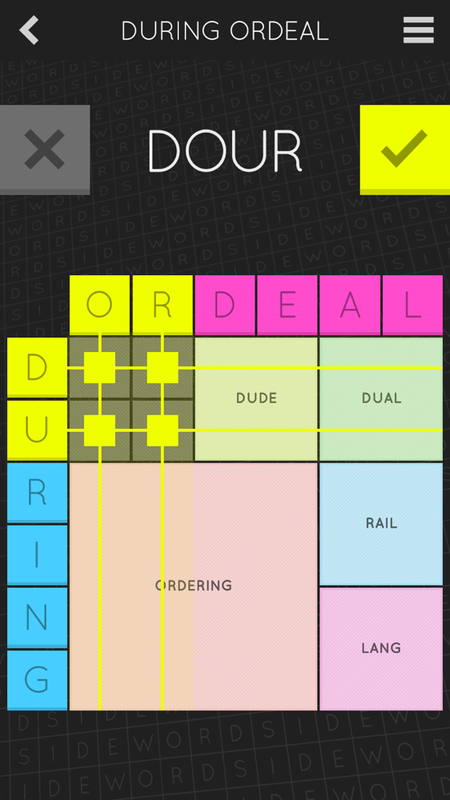 Sidewords is a paid game with zero IAPs or ads, as those would interfere with the developers’ intention, which is to give you a relaxing puzzle to work on with your morning coffee, like you would do with a daily crossword puzzle. And like crossword puzzles, this game involves thinking of words in a limited space. So what is Sidewords exactly? There are two game modes, so I’ll talk about the Puzzle mode first. It’s a fairly simple concept on the surface, but it lends itself to some real head-scratchers. 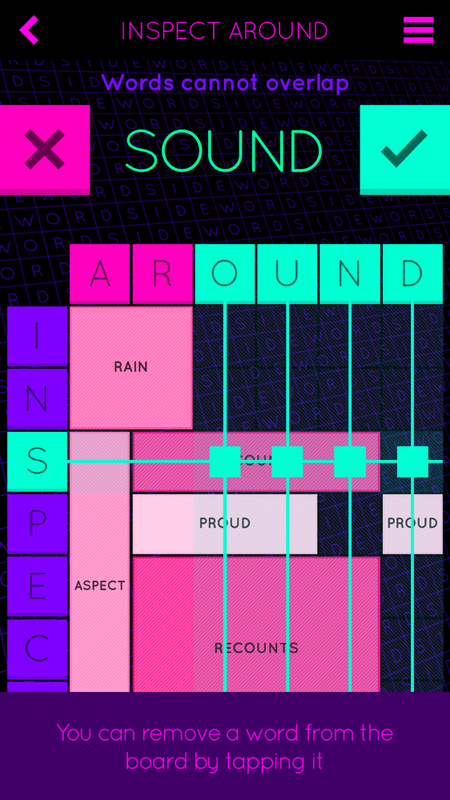 Each level gives you a grid with a word going across the top and another word going down the left side. Your goal is to fill in all the squares in the grid by combining letters from both words. The words need to be at least three letters long and include at least one letter from each of the two words. The other catch is that you can’t reuse any of the squares on the grid. If you try to overlap, the game will stop you and tell you that you can remove a word by tapping it. This is where the game gets even trickier than Typeshift, since there your goal is to use all letters, but you’re not limited to how many times you can use each one over. Here, you might be super proud of yourself for creating a huge word, just to find out that it limits you too much with the remaining letters. Scrapping a big word to find others that fit better can be a bit painful, but it is really satisfying to see the board fill up as you find words to fit all of the letter combinations. I even managed to make one word out of all the letters once, which made me feel pretty smart, even if it was a short word. There’s a generous number of puzzles available for the single purchase price of the game. It includes six packs of thirty-six levels, or 216 in total. Some are easier than others, depending on the length of the words and the letters in them. For instance, it’s not too hard coming up with lots of words using the letters from LATE and SET. But start adding more letters, including lots of vowels like I, O and U crossing paths, and you get some pretty devious puzzles. You could end up with only consonants or only vowels left. Once again, squares on the grid can’t be reused, so when a level gets trickier, it can take some time to solve. I’ve had the game for a few days already but only completed about seventy levels so far. It can be frustrating at times, but I always come back to them with a fresh eye to see what words I can think of and maybe solve a puzzle that was giving me trouble earlier. What’s nice is that you can jump around as much as you want between the different puzzle collections of varying difficulty levels. The only ones that must be unlocked to access are every sixth puzzle and then the last set of six puzzles in each collection. They’re meant to be harder ones, so you have to prove yourself to access them. I think it’s a great way to reward players for completing everything while still offering plenty of freedom to those who don’t want to play in a linear fashion. For those who really love the game and never want it to end, you can always go back to puzzles you solved and clear them out, then try to come up with new words and a cleaner solution with maybe bigger words. The game saves and can restore your last solution, even if you clear out the board. It’s a nice touch that wasn’t absolutely necessary, but shows some extra thought that went into the game. It might have been even better to have all your solutions saved, but perhaps that’s asking a bit too much. While I haven’t experienced any issues with the game recognizing known words, I have occasionally had it recognize words I couldn’t find in any online dictionaries. Typeshift has also had this issue on occasion, and while preferable that it not happen at all, it’s happened rarely enough that it doesn’t ruin the experience for me. Also, since the game saves your last solution, you can always go back and edit some of it to see if you can come up with better words that you know are words. 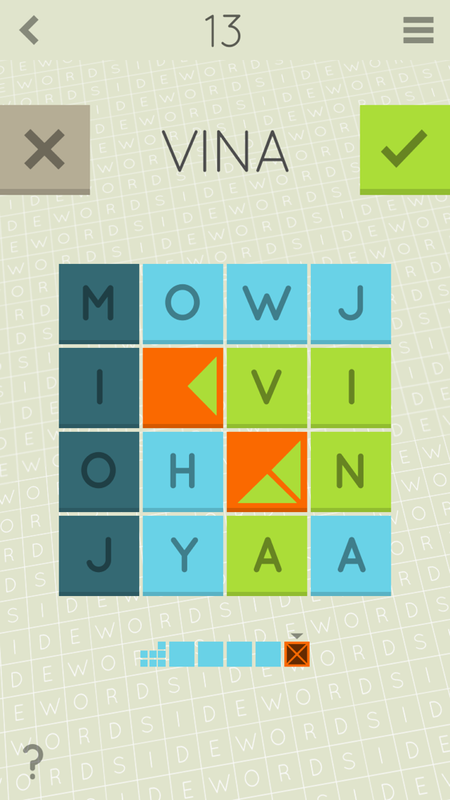 As I mentioned above, there are two games modes in Sidewords. The second one is called Quads and is an endless high score chaser that uses the Threes! swiping mechanic but has you creating words instead of combining numbers. It’s called Quads because you get points by clearing out pink squares. You swipe to pull letters and quads onto the board, with a little map at the bottom telling you how soon to expect the next quad. You then select a letter and try to form a word by tapping on other letters next to it or diagonal from it. You might not realize at first, but you don’t need to select the letters in a strict order. It’s a bit hard to explain, but you can jump around to letters that are touching one of the other letters you already selected. The catch is that you don’t get any points for the words you make. Instead, you need to light up the sides of the quads by removing letters that touch them. Once all four sides are lit up, you’ll get a point. If you move more than one quad in a single move, you’ll get an extra point for each extra quad. So the first one gives you one point, the second gives you two, the third give oh three points, and so on. I have mixed feelings about this, as it can make the scoring move at a snail’s pace. It might be exciting to see a big word you can make and tempting to select it, but if it won’t help you clear out quads, then it’s a waste. I’m still working out strategies, as my high score is only 46. But I’m finding it a bit hard to stay motivated when a game can go on for a while and still end with such a low score. Early on it takes a while for the quads to enter the board and then later they come in too quickly and fill up the board. I’m curious to see how others do now that the game is widely available. But at the moment, it doesn’t quite have that “one more round” pull for me as other high score chasers like Threes!, or even the puzzle mode. Perhaps something needs to click and then it’ll become my new addiction. For now, I just see it as a bonus game that I can play whenever the mood strikes, even after I’ve completed all the levels in the Puzzle mode. If you like your word games to challenge you and have a little more meat on the bones than all the cookie cutter games out there, Sidewords is a good choice. It’s a relaxed game without any timers or distractions and it doesn’t incentivize you to come back and play. You can try to complete the whole game in a week if you’d like, or take your time and play one level a day. And while the mechanics limit your options, the words you can think of are up to you, not the whims of some ridiculous AI. And if you’re impatient or find either mode too difficult, the game includes free hints to help move you along. I’m definitely adding this to my daily rotation along with Typeshift, at least until I complete all the puzzles. If you’re looking for a word game with some unique ideas, go download Sidewords here.